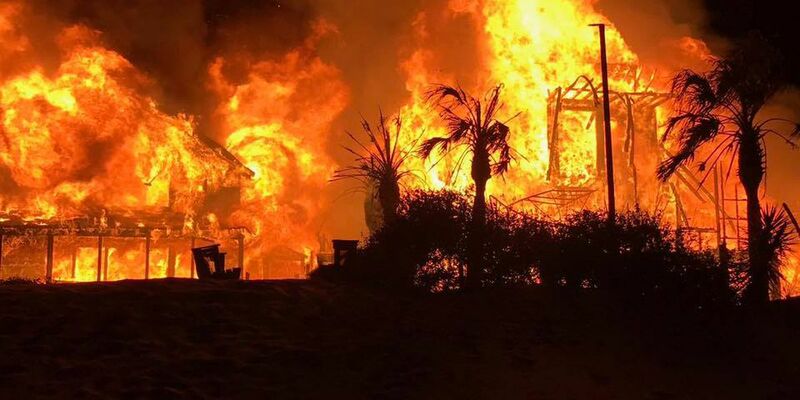 PAWLEYS ISLAND, SC (WMBF) – Two beach houses were destroyed and one was damaged on Myrtle Avenue in Pawleys Island after a three-alarm fire broke out Wednesday morning at 3:47, according to Chief Doug Eggiman with Midway Fire Rescue. Eggiman said the cause of the fire is undetermined but foul play is not suspected. Officials believe it started at 386 Myrtle Avenue and spread to 388 Myrtle Avenue. One of the structures was collapsed when crews arrived on the scene, and the other was fully engulfed by flames. Another beach house was damaged by the fire, but it's expected to be okay. Nearby structures were also threatened, and there were a large amount of embers, he added. There weren't any occupants in the structures.